Who is hockey’s all-time greatest player? Is it Gordie Howe, Bobby Orr, or Wayne Gretzky? Ask ten of the game’s recognized authorities that question, and you will likely get ten different answers. It is almost impossible to be totally objective in dealing with a query like that. The same applies to any list dealing with the world’s fastest game. Go on line and you’ll find several different “top” categories: “The Top 10 Shootout Goals”; “The Top 50 Prospects”; or “The Top 30 Goalie Rankings”. What applies to the initial topic at hand, applies to those picks as well. Perhaps the more panelists involved in such choices, the less subjective the decision; but objectivity is rare, if not totally missing. Having said all that, I must admit that this same principle will apply to this next-to-last column for this season. In my opinion only the dozen classic photos which will be unfolded in reverse order of choice represent my selections. These choices, in effect, reflect my insight into how the incidents or the personalities bear a lasting impact on Canada’s National Sport. 12. 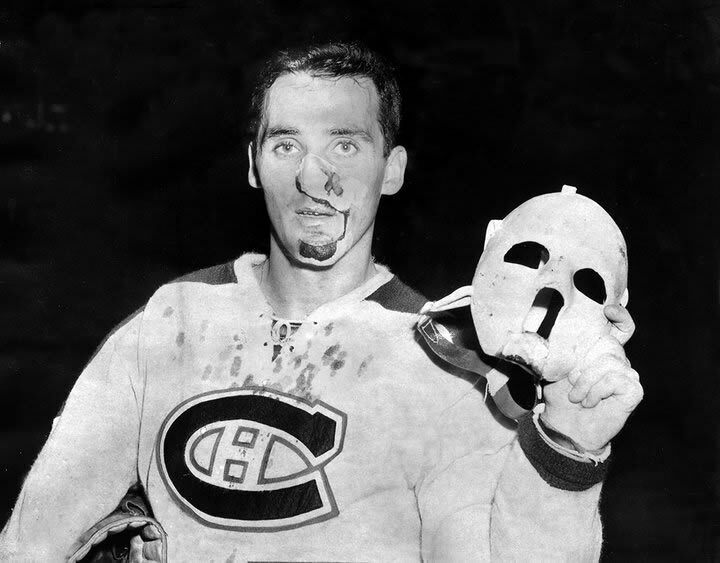 JACQUES PLANTE’S BLOODIED FACE COVERED BY HIS FIRST MASK: “Jake the Snake”, as he was sometimes called, was not the first NHL’er to wear a face mask—Clint Benedict sported one for a few games back in 1930. But Plante was the first to wear it consistently. He set the pace for twine-tenders, both for what was then the present, and the future. On November 1, 1959, the Ranger’s Andy Bathgate let go a blast which caught the Hab’s goalie full in the face, breaking his nose. “Handy Andy” later admitted it was on purpose because of a beef he had with Plante. The innovative backstop returned to action after repairs—wearing the crude face protector he had used in practice since 1956. He made it plain he would not stand between the pipes without it. Coach “Toe” Blake was livid; but since he had no other goaltender on hand, he reluctantly gave in. He stated, however, that it must come off as soon as the cut was healed. Eventually it did—for a short period of time—then went back on to stay. Despite the opposition, and amidst the taunts about his lack of courage, he prevailed. It wasn’t long until Don Simmons and Gerry McNeil—and even the great Terry Sawchuk – saw the common sense factor in protecting one’s face against 100 MPH misguided missiles. 11. 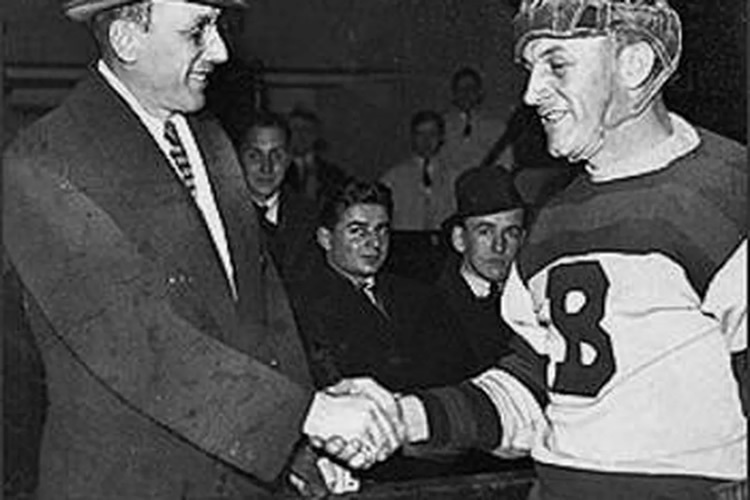 “ACE” BAILEY AND EDDIE SHORE SHAKING HANDS AT THE BENEFIT GAME FOR THE FORMER: The story has been told ad infinitum. On December 12, 1933, the Big Bad Bruins were hosting the Maple Leafs. The line-ups included the penalty-king, “Red” Horner, the pesky “King” Clancy, and the bombastic Eddie Shore. In typical fashion Clancy got under Shore’s skin. His retaliatory move, however, misfired. Thinking he was taking revenge on the little Irishman, he mistakenly clobbered “Ace” Bailey instead. When the latter hit the ice, his skull fractured, and he lay “twisted and twitching” as if experiencing a seizure. Rushed to the hospital he had two major brain operations, and hovered between life and death for 10 days. Ace recovered to live a near normal life, but his hockey career was over. The league sponsored an All Star game to raise money for him. Previous to the match, Shore and Bailey met at centre ice, where they shook hands and embraced. “It’s all in the game, Eddie!”, was the victim’s reassuring words. That moment was the most defining one of the evening. A bitter, on-going feud was averted, quenching a blaze before it got started. 10. WILLIE O’REE SKATING ONTO THE ICE AS THE FIRST BLACK TO PLAY IN THE NHL: It was January 18, 1958—the scene was the Montreal Forum. 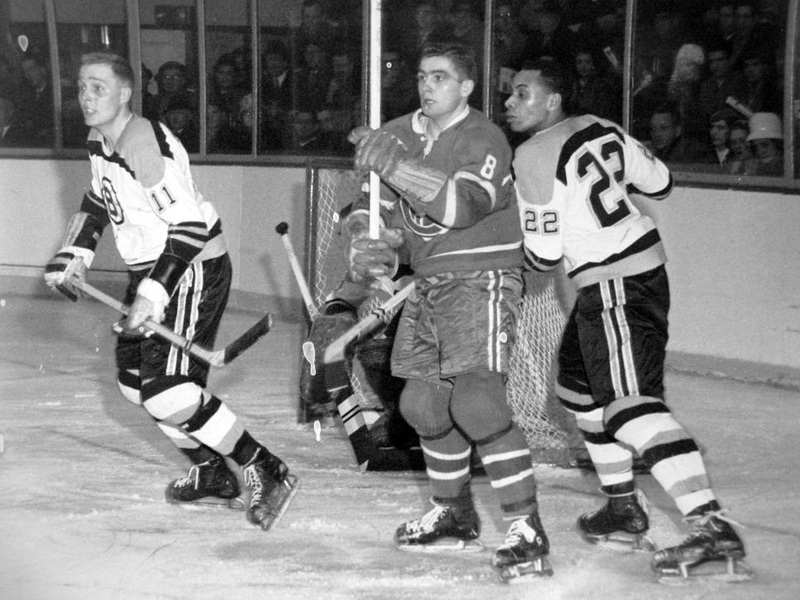 For the Mount Royal city fans to see Willie O’Ree on that ice surface was not new. As a member of the Quebec Aces of the QHL he had often skated there against the Royals. It was not all smooth going for him as he broke this barrier. He did hear many cat calls from the stands. In Detroit he was refused service in a restaurant. But he had taken a giant step for his race. In years that followed many of them also suffered unfairly because they were black. But the pace had been set. 9. 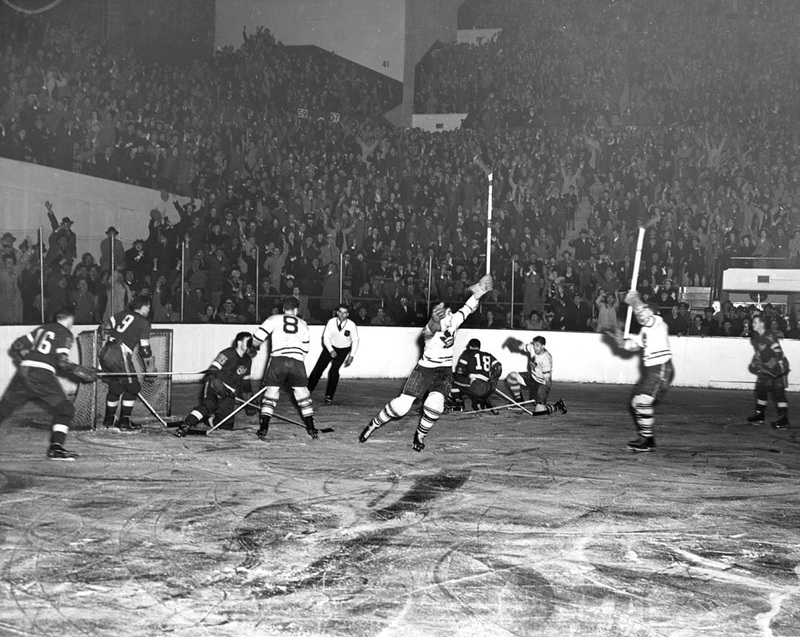 THE TORONTO MAPLE LEAFS AMAZING COMEBACK IN THE 1942 FINALS: Precedents are always significant! In the spring of 1942 the Toronto Maple Leafs were down 3 games to 0 to the Detroit Red Wings in the Stanley Cup finals. The probability that they could climb out of that hole was next to impossible. It had never been done before, and the initial three contests left little hope for their recovery. They must have done just that. The new recruit, Don Metz, assisted on his older brother Nick’s winner in a come-from-behind spell-binder. Back in Toronto they carted off a 9-3 win, with the younger Metz racking up the hat trick, plus two assists. In game six goalie “Turk” Broda did everything but eat the puck, pacing them to a 3-0 triumph right in the Wing’s own back yard. Game 7 was a nail-biter. Behind 1-0 heading into the final frame, Schriner tied it in the early going. Then Pete Langelle (pictured wearing #8) untied the knot at 9:48. Schriner added the insurance marker for a decisive 3-1 victory. Since then, the New York Islanders did the trick against Pittsburgh in 1975; Philadelphia pulled off a rebound in 2010 against Boston; and the Kings put the Sharks out of the playoff picture in 2014. But these instances were in earlier rounds. The 1942 comeback was the only one recorded in the finals. 8. SIX BROTHERS MAKING THE GRADE IN THE NHL AT THE SAME TIME: In fact there had never been more than four from the same family who reached the Big Time, let alone being active all at the same time. I speak, of course, of the Sutter siblings, the farming family from Viking, Alberta. From 1982-83 through 1987-88, they all dotted NHL line-ups. There have been other families with as many as four whose talent took them to this elite level: “Buck”, Billy, Bobby, and Frank Boucher is one clan; Eric, Marc, Jordon, and Jared Staal are the other. If their rise to shinny’s lofty heights had taken place in the “Original 6” era, it would not be surprising to note that the freres occasionally played together on the same club. But it did happen even with expanded NHL. Duane and Brent were members of the Islanders from 1980-81 through 1986-87. Ron and Rich, who are twins, managed to end up on the roster of the St. Louis Blues from 1991-92 through 1992-93. Add to that a brother coaching brother spin. Brian was bench boss in Blues-ville while Rich was in the line-up from ’89-’90 to ’91-’92; and while Ron was on the roster for ’91-’92. Darryl mentored Brent in Chicago from 1992 through 1994-95. It is an understatement to say there has never been another set-up like it. And now the second generation is carrying on the tradition, with sons Brandon, Brett, and Brody. Hurricanes, in the Left and Right Wing and Centre positions. 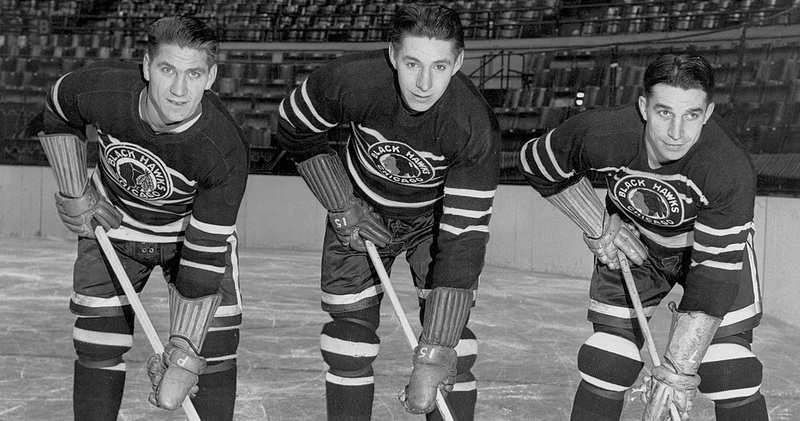 But when Reg Bentley showed up at the Chicago training camp in the fall of 1942, the stage was set for a new kind of on-ice combo. Doug has joined the Hawks first, all the while saying that he had a brother at home “better than I am”. So Max donned the Windy City sextet colours. In turn he kept insisting that there was another brother at home “better than I am”. Thus, with the way the first prophecy had worked out, Manager Bill Tobin felt he couldn’t lose by having a look at the third one. Reg was signed to a contract, but the idea of an all-Bentley forward line was put on the back burner. Bill Thoms had jelled so well with the incumbent brothers, that it wasn’t until he was injured, that finally, on December 3 the dream was realized. But Chicago management was not convinced of the third sibling’s major league caliber. The experiment lasted but one match. Reg did play a total of 11 games, scoring one goal and 2 assists. That ended the fantasy; but the rarity of the accomplishment could never be taken away from them. 6. 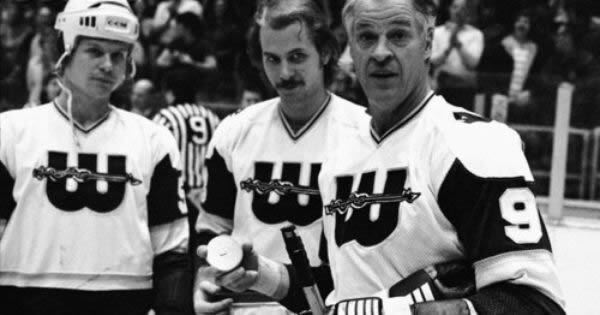 GORDIE HOWE AS A TEAMMATE WITH HIS SONS, MARTY AND MARK: At this point some reader may feel like calling “time out!” Here is another family combination inserted in a limited list of “classic” hockey photos, I admit. BUT All three are included because of what they represent—a very rare scenario in the world of hockey. As the first father/son combination to skate together in the NHL, the picture alone, without any caption, would speak volumes on its own. The history behind it is well known. After 25 seasons with the Red Wings, “Mr. Hockey” hung up his blades. One of the main reasons was an arthritic wrist. Always in the back of his mind he had dreamed of someday being on the same club as his boys. He had played with them in a fund-raising game as part of the Junior Detroit team. But the age limitations for drafting in the NHL made it clear this fantasy was out of the question. Enter the WHA. Houston wanted the boys. Colleen Howe, family manager, agreed to the signings if Dad could be a part of the deal. The rest is history! His wrist had been surgically repaired and his dream was in sight. The trio joined the Aeros in 1973. 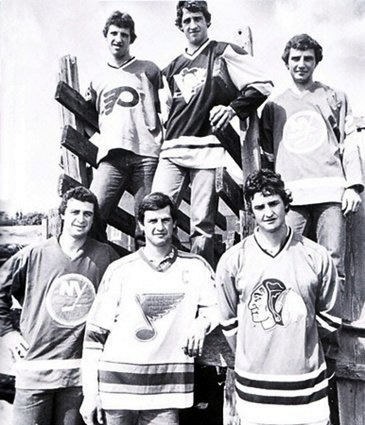 From there they went to the New England Whalers—and when that sextet was included in the WHA/NHL “merger”, they went right along with the transition. The photo of Dad and lads in Hartford colours, is like the situation itself—legendary! 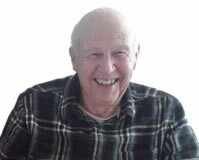 His broadcasting of hockey began in a primitive manner, in a phone booth-type enclosure in the old Mutual Street Arena. From this stifling enclosure he called the play-by-play of a match between the Toronto Argonauts and the Kitchener Greenshirts. It was there that his famous “He shoots! He scores!” slipped out. It has been copied or adapted by scores of broadcasters over the years. When the Toronto St. Pats became the Maple Leafs in February 1927, owner Connie Smythe commissioned the one-time Toronto Daily Star reporter to call the action of this newly-named team’s contests. When Maple Leaf Gardens opened in 1933 the eventual Hall of Famer was afforded his choice of locations to continue sending the team’s games over the airwaves. It was then that the famous gondola was erected. 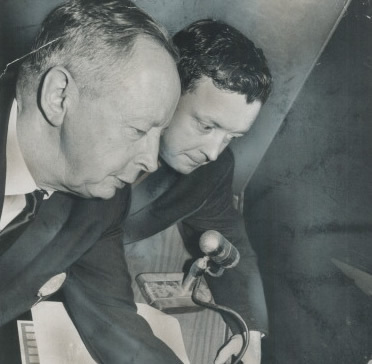 Eventually, when the CBC took over, the play-by-play of the action became a coast to coast programme. Because of that the Blue and White became known as “Canada’s hockey team”. It was estimated that some 6 million listened in to his lively description of the on-ice action during a single match. His traditional “Hello, Canada, and hockey fans in the United States (and Newfoundland for a while)” became legendary. first time. Eventually, he turned this prime position over to his son, Bill, and he acted as “colour man” for the games. He is long remembered for many things, but his coverage the 1972 Summits Series stands at the top of the list. Every replay of that milestone set of games is a tribute to this great shinny icon. 4. WAYNE GRETZKY’S TEARFUL PRESS CONFERENCE FOLLOWING HIS TRADE TO L.A.: Once more, a “picture is worth a thousand words!” Trading a player of “the Great One”’s stature can be designated as either the most gutsy, or the most idiotic moves ever in this great game. 3. BILL BARILKO’S OVERTIME GOAL IN THE 1951 STANLEY CUP FINALS: The name of the game is “score”—so these next three picture-perfect shots are of shots that found the mark and brought victory. 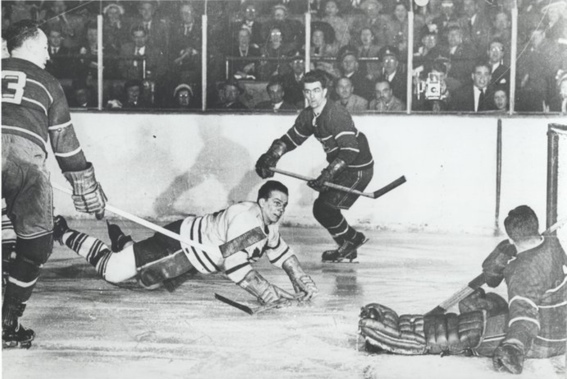 On April 21, 1951 the Toronto Maple Leafs hosted the Canadiens for game five of that Stanley Cup final. Leading 3 games to 1 in a series in which every game thus far had gone into overtime, they knew, as always, that this was a key contest in their march to the Cup. With the Habs leading 1-0, with only a minute left in the final frame, Coach Joe Primeau pulled his goalie. It worked! Tod Sloan tied the score forcing still another match with an extra frame. Less than three minutes had elapsed when Howie Meeker had possession of the disc behind the Montreal net. He launched it out front in hopes that a teammate could convert it into the cage. Defenseman Bill Barilko saw the move and dashed over the blueline before backhanding the puck over Gerry McNeil’s shoulder. As the red light flashed he was still in a fallen position after his daring move. ”Daring” because his bench boss had strictly forbidden him to leave the point position. “Teeder” Kennedy recalls the brash rearguard yelling “I guess I won’t get the hook now” at his now jubilant mentor. It is a little known fact that the curly-haired defenseman accomplished his feat while playing with a broken nose. 2. 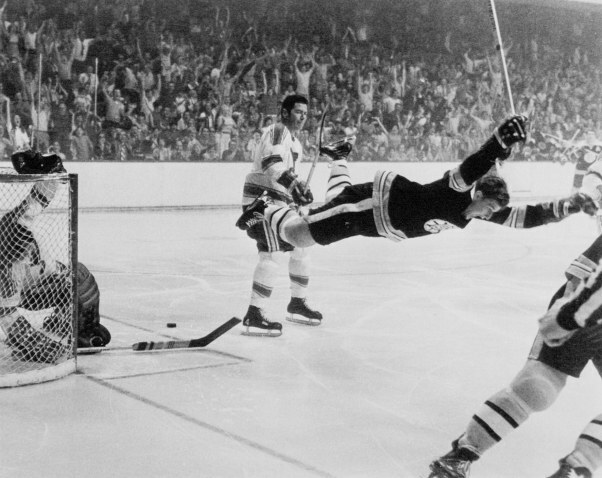 BOBBY ORR’S FLYING LEAP AFTER TALLYING THE 1970 CUP-WINNING GOAL: The St. Louis Blues had only been part of the world’s premier circuit for three seasons. But each of those campaigns they made it to the Cup finals. Under the old East vs West format, the best of one conference met the best of the other to determine the Stanley Cup Championship. But the smile on his face testifies that his involuntary horizontal leap simply replaced his normal vertical one which usually celebrates goal-scoring success. Ray Lussier’s rare photo is testimony to a photographer’s perfect timing! 1972 Summit Series has been called. Thus it is picked #1, not so much because of the end result of the eight-game competition, but because of the story book fashion in which it was scored. There were aspects of this international on ice exhibition about which neither side needs to be proud. Some of the behind-the-scenes skullduggery directed toward the Canadian team cannot be overlooked. Neither can the vicious slash by Bobby Clarke on Kharlamov. But it was the comeback drama, and the nail-biting finish which this Frank Lennon award- winning photo represents which warrants this royal treatment. With only a win and a tie after four contests “at home”, the prospects of salvaging the tournament looked dim. It became even worse after the 5-4 loss in the first match in Moscow. by a single marker in both cases—Paul Henderson providing the winner each time. As the final confrontation got underway, once more there was gloom forming on the horizon. The USSR were ahead at one point by a 5-3 count. Then Phil Esposito, who was the blood and guts catalyst throughout, put the visitors within one. Yvan Cournoyer tied it. In the final minute—with only a win being acceptable--Henderson called Pete Mahovlich off the ice, “because I had a strange feeling I could score the winner!” He did! Having fallen behind the net, he slipped out in front just in time to snake Esposito’s rebound behind Tretiak. There were only 34 seconds left when it bulged the twine! At that moment Canada was number one—as is this photo in this abbreviated gallery! Just off the record—getting back to who is the greatest—Howe, Orr, or Gretzky? Since my personal answer cannot affect whether you read this missive or not—my subjective opinion—it’s Bobby Orr!